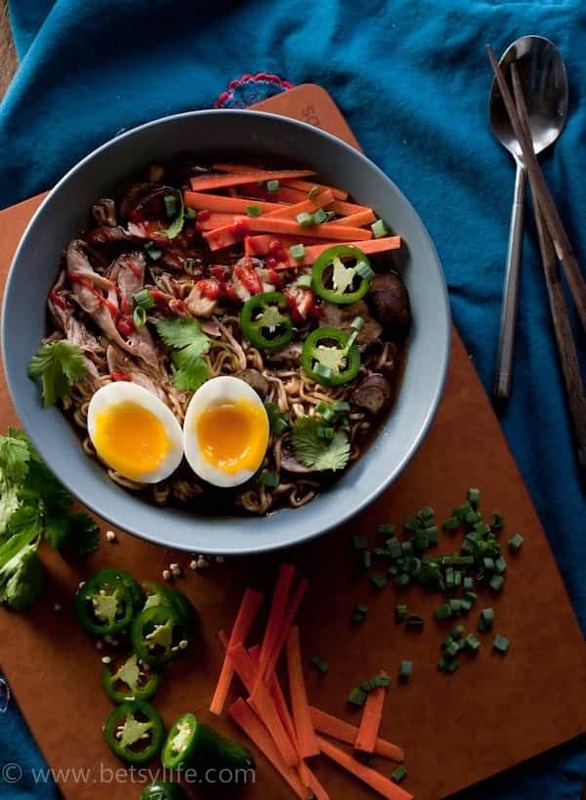 Crock pot ramen is the most epic recipe for cold weather! Hearty, rich and satisfying, this pork ramen soup will keep you warm this winter. 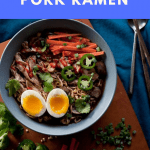 It’s slow cooker season and I’m excited to bring you not only this great crock pot ramen soup recipe, but 11 other slow cooker soup recipes as well. That’s right folks, 12 bloggers is back, and we’ll be presenting you with some seasonal treats on the 12th of each month for all of 2015. There are only two things I like about winter. Soup, and amazing winter sunsets. If it weren’t for these things, I would likely hibernate until April. I’ve been loving ramen this winter, and figured what better dish to adapt to a crock pot than ramen? What I love about soups like this is that each bowl can be customized with an array of condiments. Let your slow cooker do the work creating a flavorful, aromatic broth and tender meat, then let your family create their own, personalized bowl of soup. I like mine with less noodles and tons of vegetables, and The Hubs likes his with extra jalapeño slices and a generous squirt of Sriracha. You’ve only seen the tip of the iceberg. 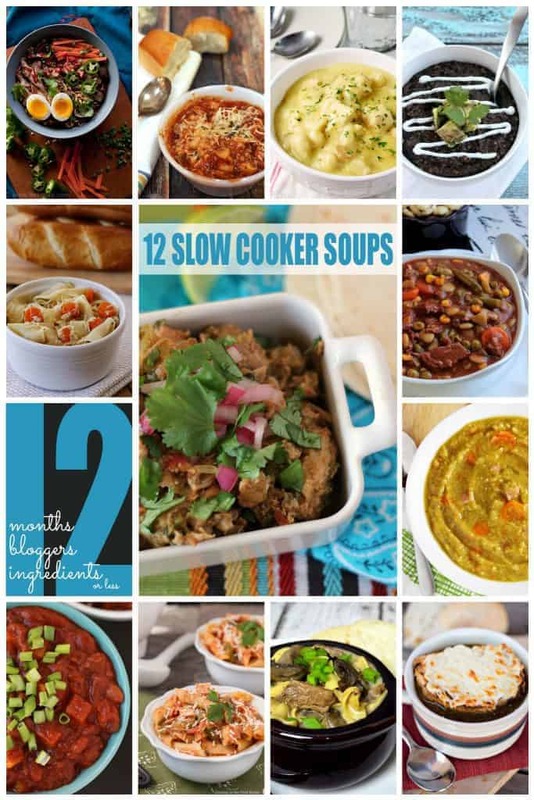 My 12 bloggers crew have enough slow cooker recipes to keep your crock pot full until spring, so be sure to click around and check out all their rad offerings. Crock Pot recipes are great for winter or summer. 2 packs Ramen noodles seasoning packets discarded. Add pork, chicken broth, soy sauce, rice wine vinegar, ginger, chili paste, lime juice and brown sugar to the crock pot. Cover and cook on low for 7-8 hours. Remove pork from the crock pot and shred. Turn crock pot to high and return meat to the crock pot along with the mushrooms. Cover and cook 10 minutes. Add ramen noodles to the pot and cook for 5 minutes or until noodles are cooked completely. Spoon into 4 bowls and top with soft boiled eggs and your choice of garnish. Looking for more crock pot recipe awesomeness? I love winter as long as I can stay in the heat haha. I’ve been craving a good ramen dish since we got back from Hawaii! I love this and the egg on top set it over the top! I’m in love! Hi Betsy! I love this soup recipe you made this month! I ve never made anything like this before but would love to try! Haven’t use my slow cooker for a while, would love to try this! This looks amazing!!! Thank you for sharing the recipe! 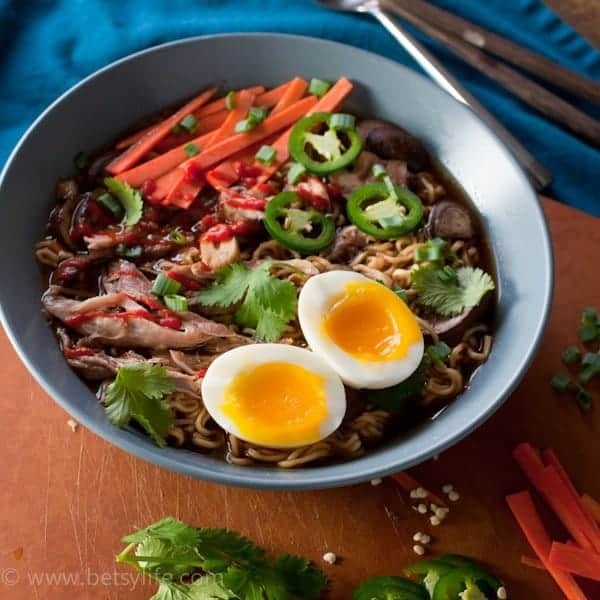 This ramen soup just looks so hearty and comforting. I can’t say that I use my slow cooker often.. so this recipe is perfect for me to use it! This sounds perfect for winter and looks delicious! 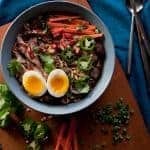 I love ramen but almost never make it at home- but this sounds so easy I think I’ll need to make it soon! I love the idea of slow cooker Ramen but I’m a vegetarian. Any ideas of how this good be veggie-fied?? 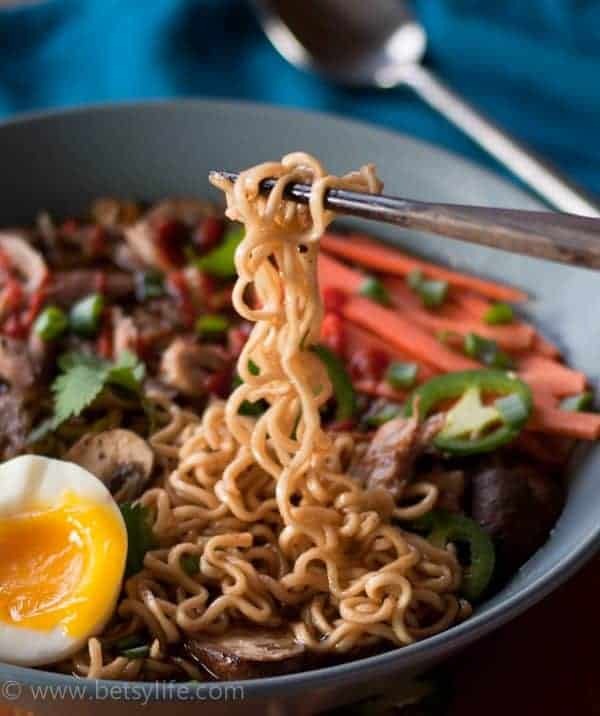 I am pretty obsessed with ramen and want to start trying to make it at home – this might have to be the recipe I start with. It looks delicious! Question: When I made pork shoulder in my crock pot before for tamales, it had a LOT of fat that cooked out and turned into grease puddles on top of the liquid. Do you have that problem with this recipe? And if so, how did you fix it? Thanks! I did not have that problem but I guess it depends on how fatty your piece of meat is. If it seems really fatty, I would skim the top of the liquid after you remove the shoulder before shredding it and adding the meat back in. I love Asian-inspired soups so I was really excited to try this. I have it in the slow cooker right now and I am really concerned that there is too much rice wine vinegar in this recipe, it is very strongly acidic smelling… I would actually say it smells really awful. Is this normal? Will the taste still be okay or have I done something wrong? Wow you are hot Betsy. Congrats on that! Also this soup looks great. 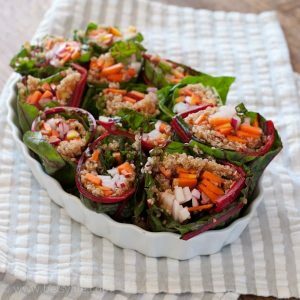 If I wanted to make this for lunch for the week, would it keep? Or would the noodles break up? Hi! I’m planning on making this in a couple days, but I work a 12-hr shift. Would it 12 hours on low be too long to cook the pork? Could it ruin the pork or dry it out? I made it tonight and my husband and I enjoyed it! Thanks! So easy and yet flavorful! Can’t wait to make this! What kind of chili paste did you use? Like a Thai red chili paste? Just wondering what to look for when I go to the store tomorrow. 🙂 Thanks! I’ll have it your way, with noodles and much much vegetables! This recipe is so easy and so delicious! I prepped all of the main ingredients and pork the night before and let it marinate in the fridge. Before leaving for work, I turned the crock pot on and let the pork cook all day. It literally fell apart when I removed it to shred. 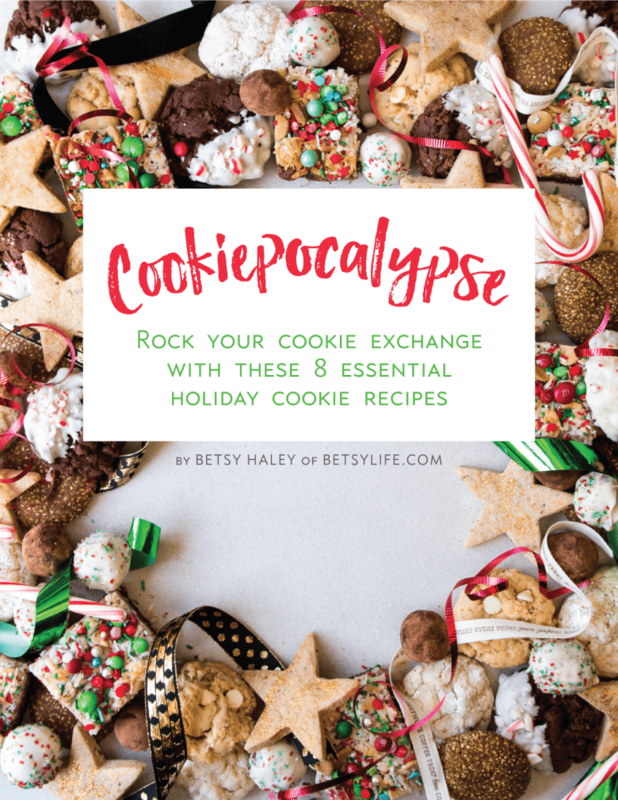 Definitely adding this to my winter recipe rotation! As the boyfriend said (after two bowl fulls) ‘you can make this recipe any time!’ Thanks Betsy! This looks so good! 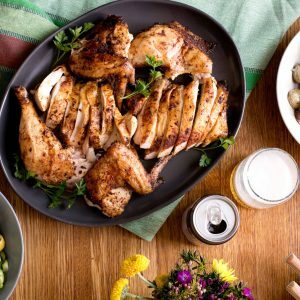 How could I do this recipe more quickly, maybe without the crockpot?